The McCoy House was the birthplace of Major General Frank Ross McCoy, Soldier-Statesman. He was born October 29, 1874. The home now serves as the Mifflin County Historical Society Museum. Within the home is the McCoy Memorial Collection, which includes the Thomas F. McCoy family Victorian Period rooms and memorabilia, plus the permanent collections of the Mifflin County Historical Society. 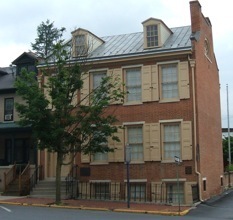 The McCoy House was acquired and restored by the Pennsylvania Historical and Museum Commission. The 1841 house is a lovely example of post-revolutionary architecture in a rural setting and is listed on the National Register of Historic Sites and the Pennsylvania Trail of History. Sundays 1:30 p.m. - 4:00 p.m. Mid-May through September 30th. Please check the News page for seasonal hours. McCoy, whose father was a brigadier general, graduated from West Point in 1897. At the outbreak of the Spanish-American War he was assigned to the Tenth Cavalry and accompanied that regiment to Cuba, where he saw his first action. On July 1,1898, he was wounded at San Juan Hill. While lying under a tree, he was assisted by the lieutenant colonel of the Rough Riders, Leonard Wood. Later Wood, now military governor of Cuba and a major general, called him to Havana as his aide-de- camp and made him responsible for insular finances, his first non-military assignment. In 1902, McCoy, now a first lieutenant, went to Washington and served as a junior aide to President Theodore Roosevelt. Early the following year he accompanied General Wood to the Philippines, Egypt, India, and Java to study colonial administration, and from August, 1903, when he became a captain, until February, 1906, McCoy served as aide-de-camp to Wood, who was now governor of Moro Province of the Philippines. McCoy participated in several operations against hostile Moros, including the expedition which he commanded against Datu Ali, last great Chief of the Moros. In mid-1906, McCoy returned to the United States and for the next several years his assignments varied. 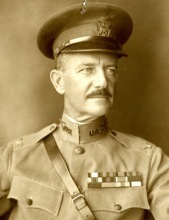 He was assigned to the Peace Commission to Cuba; as aide to William Howard Taft, provisional governor of Cuba; as senior aide to President Theodore Roosevelt; to command of Fort Wingate, New Mexico; to the Army General Staff; to command of two successful engagements against Mexican bandits; and as military attaché in Mexico City. With the entry of the United States in the First World War, he was assigned to General Headquarters of the American Expeditionary Force in France. Receiving the temporary grade of lieutenant colonel, McCoy took command of the Fighting" 69th Regiment of the Rainbow Division and commanded it through the Champagne defensive and the Marne-Aisne offensive. With the temporary rank of brigadier general, he commanded the 63rd Infantry Brigade until hostilities ceased. After the war he was made Chief of Staff of the American Military Mission to Armenia, and later served on other councils and commissions. In 1921 he returned to the Philippines, again under General Wood, and during this time took charge of the American relief activities in Japan following the catastrophic earthquake there. Other assignments of a diplomatic nature eventually took McCoy to Nicaragua to supervise elections, to Japan and China to investigate the dispute over Manchuria, and finally to Geneva to report to the League of Nations. He served his last assignment as commander of the First Army headquarters in New York. He retired from active service in October, 1938, and returned with his wife, the former Frances Judson, of New York, to his boyhood home in Lewistown to live. His public service continued, however. He was named president of the Foreign Policy Association, and was frequently called upon by the government for special assignments in inter- American affairs, civil aviation, the investigation of the Pearl Harbor disaster, and others. In 1945 he was appointed by President Truman as the U.S. member of the Far Eastern Commission, the international organization which dealt with the military occupation of Japan. He became its first chairman, which position he relinquished in 1949. He died June 4, 1954. The McCoy House is a PHMC owned property administered by the Mifflin County Historical Society. Due to cuts to PHMC grant funding for annual repairs, our Society is now responsible for maintenance previously promised or deferred by PHMC. Some repairs are urgent necessities, others are projects considered for prudent annual maintenance at our museum. The needs at McCoy House will continue to be pressing and the responsibility for maintaining General McCoy’s birthplace falls to the Mifflin County Historical Society. Please consider helping with one of our needed projects at the museum. If we were able to receive $2,000 annually directed toward museum projects, each area of need could be taken in turn. 1.Standing Rib roof repair, (partially completed at a cost of $300), but thorough repair needed to prevent further water damage below (attic, and second floor rooms). 2.Attic windows - New jams, sills and trim and install new windows. Window Sash is being completed through generous gift. 3. Reset fan in the attic to prevent water from entering around the fan. 4. Three windows in the parlor (living room) rebuild/repair sash and trim (due to water damage). 5. Update exterior illumination and wiring, including garden lighting. 6. Replace front sidewalk (reset and/or replace bricks) as part of North Main Street project. 7. Repair and paint railing on second floor porch. 8. Repair granite steps in front of basement entrance. 9. Paint front of Carriage House, and make exterior repairs as needed. 10. Paint front wrought iron railing. 11. Front door and back cellar door in need of repair. 12. Dry rot in the attic ceiling. 13. Painting projects inside and out as part of regular, annual maintenance. 14. Old electrical room heaters replaced with an environmental humidification system, to better maintain the collections. Please consider helping financially in an area of interest to you! Click here to use PayPal and designate what area you would like your contribution to go to. Copyright © 2012 Mifflin County Historical Society, All Rights Reserved.